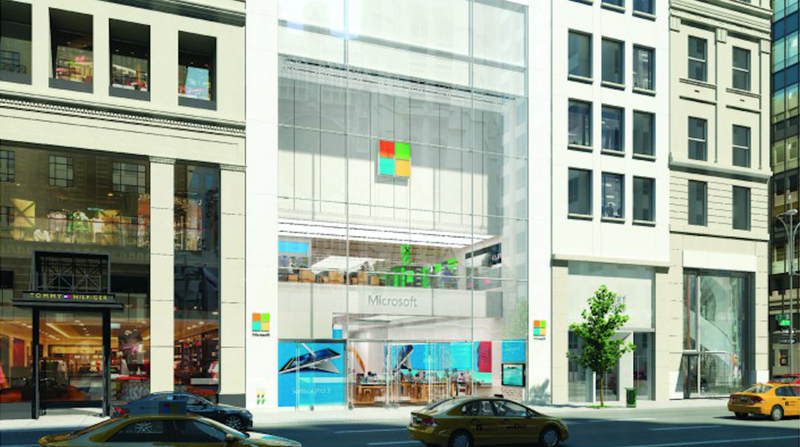 Microsoft is getting ready to unveil its flagship NYC on October 26 as it prepares to make a big hardware push next week. The new store will be located at 5th Ave and 53rd St, just a few of blocks away from the first-ever Apple Store on 5th and 58th. It was first announced a little over a year ago, but Microsoft says it’s been working on the project for over six years. The shop will be its largest yet at 22,269 square feet and will include both Microsoft’s own hardware and partner highlights, advertised via large video walls throughout the shop. For consumers, there’s there’s something called a Community Theater to learn how to integrate Microsoft products into their lives, while an Answer Desk is the company’s take on the Genius Bar for technical help. It’s also pretty smart location for Microsoft. 5th Ave is popular for both tourists and some New Yorkers alike, and the Apple Store’s location makes it the first big retail stop for many shoppers, aside from just selling an insane amount of products. That Microsoft’s store is just a few blocks down makes it likely many Apple Store visitors will simply walk for a couple of blocks and check out Microsoft’s afterwards. That said, we doubt it’ll be open 24 hours like Apple’s flagship, and there’s no word on whether Microsoft will allow rappers to record their albums in-store. Microsoft is hosting an opening celebration, though it’s vague on details. Still, you can expect next week’s new devices to be available there at launch.